Gharghur is very much a typical Maltese town, with a multitude of narrow winding lanes all leading to a main square that is dominated by a huge church. Although the setting is unique and spectacular – built as it is into a disused quarry – Gharghur is also typical in that it now boasts one of the synthetic pitches that thanks to UEFA’s and FIFA’s money are replacing gravel ones all across the island. It is at the clubhouse adjacent to this pitch that I meet Ben Perry Acton as he and some of his Gharghur FC teamates pass the time before training kicks off by watching a rerun of one of the previous weekend’s Premiership games. English football has always had a massive following on the island, a heritage of the island’s colonial past, and there’s blanket coverage of all the games in the Premiership and even some from the Championship. “I do yeah, every week!” is the enthusiastic reply about whether he follows Blackpool, one of his former clubs. “It is the first score I look for every weekend. 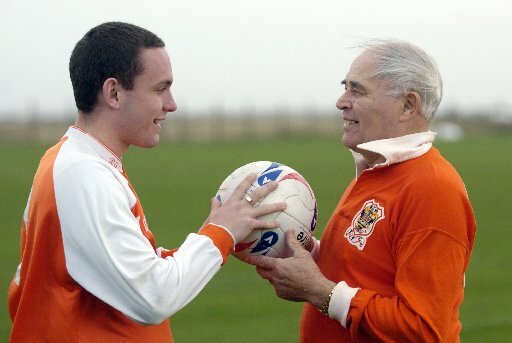 I’ll never stop following Blackpool.” “Last season was brilliant as well as a bit devastating. I think that Blackpool was every neutral’s favourite team. They were a small club but had a lot of heart, they were entertaining to watch and very,very unlucky to go down.” Other than Blackpool, Perry Acton played for other clubs, among whom is Bolton, yet these do not seem to have a similar hold him like the Tangerines and with good reason: his grandfather Bill Perry not only played for them but also scored the winning goal in the 1953 FA Cup final. It is clear that the prospect of following in his grandfather’s footsteps must have been a huge ambition for him. Making, one would imagine, the decision to leave football a more difficult one. “It was in one respect. I played for Wigan and Blackpool. After being released by Blackpool, my confidence was knocked quite a bit. I carried on playing with a team called Cliterhoe which is a side in the North West Counties and slowly started rebuilding my confidence to build my way up again.” But then came the decision to leave. ”I’ve been coming to Malta with the family every year: my mum and dad have a holiday home in Sliema. And I’ve been saying it every couple of years that I wanted to move over. Then me and my girlfriend decided that time was right. Not specifically because of football but because I love the island and everything about it. It is so laid back and we just thought that there was nothing to lose and to just go for it. When I moved here, my first intention was to find a club. I went on trial with a couple of Premier League clubs – Hibernians and Sliema – but nothing came of them. And then Pieta were interested and signed for them. Then, after a season, I moved to Gharghur. I love it here, I love the club, the people. I live in the town even so it is nice." This article originally appeared on TwoHundredPercent.